A couple of years ago we went to the Corpus Christi / Port Aransas area for an extended weekend with Glenda and her son Slaydn. We had a chance to repeat that trip last week and once again had a terrific time splashing in the ocean, spending time with friends, and getting our fill of seafood! This time, we were also joined by Georgina a.k.a. “GiGi” and her boys Nolan and Blake. We stayed at the posh Port Royal and the boys loved the water slides that were at the end of the elaborate set of 5 interconnecting pools. Glenda even worked up the courage to zip down the twisty water slide tubes! Of course, we had to eat at The Crazy Cajun for the Cajun boil! Thanks to advice from Dave I., we all went out on a 4-hour bay fishing charter and had a fun time reeling in Gafftop catfish. What’s more, the bay dolphins sensed that Dede was about the fishing boat and came along for a few visits. And our catch was promptly cleaned then we took the fillets right over to Kody’s to have them fried up with trimmings just minutes off the boat. The fish was terrific! We also had a great time at the Texas State Aquarium in Corpus Christi. We got to touch Sting Rays and watch a dolphin show from a unique underwater perspective. Later, we enjoyed a special viewing of The Lego Movie from poolside at the Port Royal. Adults watched from the patio areas while the kids floated in swim rings during the whole show. Click on the boardwalk photo below to see pictures from our vacation! Click here to view more pictures from our Port Aransas beach vacation! We celebrated Liam’s highly-anticipated 7th birthday this year by doing something different and having his birthday party at a private gymnastics facility. We thought it was an original idea but now it seems like everyone else is doing the same thing this year. It’s a welcome relief from the jumper/arcade/pizza parties and I sure do prefer the private parties to being mixed in with the crowds at the public facilities. Liam’s chosen theme for this year’s party was Batman, which made it pretty easy for us to put together. Instead of the traditional 1/2 sheet cake, we did a cupcake cake (a bunch of cupcakes iced together to look like a cake). I made the mistake of not asking what color the icing was going to be so we ended up with lots of blue faces at the end of the party. Note to self: only do white icing from now on! The kids (and a few of the adults) had lots of fun jumping on the trampolines, walking the balance beams and tumbling on the mats. It’s definitely something I would do again! I can’t believe my baby is now 7 years old. The last 5 years have just flown by so quickly that I know I’m going to wake up one of these days with a teenager on my hands and I’m just not ready for that! Until then, here is my sweet baby boy having fun at his birthday party. This year Liam played soccer for the first time. The jury is still out on whether he liked it enough to play again. I enjoyed it much more than T-Ball because it is faster paced and the season ends just as our temperatures start hitting triple digits! Yesterday was the final game for the season and the kids were very excited about getting trophies. Liam is so proud that he carries his trophy all around the house with him. When we began car-shopping recently to replace Dede’s Honda CR-V, I suppose it was only natural that I’d catch the new car fever too, even though there’s nothing wrong with my trusty Element aside from it being 10+ yrs old and lacking in all of the techno-goodies, conveniences, and creature comforts of the cool new vehicles. It was while I was half-looking for a suitable replacement, however, that I was very inspired by the EcoModder “Buy a Trailer Instead of a Pickup Truck” thread that I just stumbled upon. The argument that a trailer (and hitch) added to an existing car can give you almost all the functionality of a truck without the lower fuel efficiency—or hefty new car payments—really appealed to me. Even as much as this seemed like a great idea, I had all but dismissed the whole thing as impractical since I don’t have any space to park a trailer. But then several pages deep into the thread, I read a comment about the Haul Master Folding Trailer at Harbor Freight and I was hooked! Who would’ve guessed that a couple of unassuming (but heavy) boxes would hold an entire trailer?! It went together fairly quickly with Liam manning the power tools! Liam rocks the cordless driver! And there’s tons of cool stuff to accessorize the trailer at Harbor Freight and RedTrailers.com. Of course, the whole time we were working on this, Kenny Rogers’ “Gambler” was the song that stuck in my head. But Dede’s theme song for this project was different—she kept singing that line “Trailers for sale or rent…” While I’m confident that what was going thru her mind was the classic Roger Miller version, I really dig Josh Turner & Randy Travis’s rendition of “King of the Road”. We just returned from a fantastic 10 day vacation to Virginia Beach! We flew into Washington DC and stayed a couple of days with our friends Chris & Teresa and then we all drove to Busch Gardens in Williamsburg. It was very hot and humid but the park was not crowded at all. Liam rode all the rides they would let him on, including the Loch Ness Monster (his first roller coaster). The next day we drove to Virginia Beach and spent the next 5 days there. Our hotel was right on the beach and Liam loved playing in the ocean! We visited the Virginia Aquarium and took a ride on The Lost Pearl. Those pirates really work at entertaining the kids! On our last day at the beach, Troy and Rachel drove down to meet us. We’ve been following each other’s blogs for years, but had never met in person. Their son Daniel and Liam hit it off famously just like we both had predicted they would. It was so nice to finally meet. Thanks again for making the drive down! What wonderful memories and it was so nice to spend time with Chris, Teresa and Anna again! Click the link below the picture to view more pics of our vacation. Click here to view more pictures from our Virginia Beach vacation! As much as the classic game Monopoly was a perennial favorite at family gatherings when I was a kid (and I look forward to the day when my son is old enough to start learning to play) I have to admit that I never gave even a moment’s thought to the properties arranged around the board. They were just abstract things that you needed to own plenty of if you wanted a chance at winning the game. I suppose that way down deep, I might’ve had some vague notion that the Monopoly squares were named after actual locations but I never had any notion of where that was or what those locations might really look like. 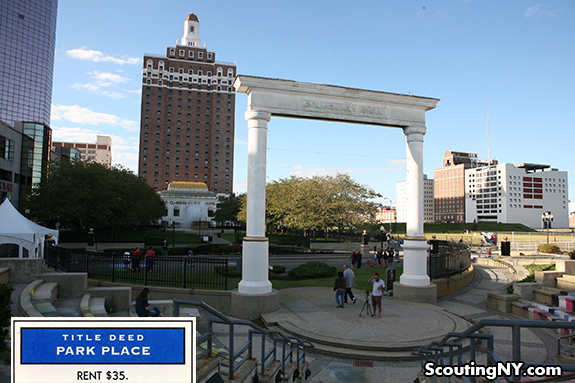 Well sure enough, the properties up for grabs in the game are indeed named after real locales in and around Atlantic City, New Jersey and Nick Carr at Scouting NY recently paid a visit to those sites represented on the Monopoly board and showcased the images from his trip. Does seeing the real locations that the Monopoly properties are based on give the game a different feel for you? Does this make you wanna dust off the old classic and play it again? and a comparison stairwell photo. We had a wonderful Christmas but it felt a little strange this year not having Nanny Karen in town. We hope that she will be back with us next year. Liam just managed to keep himself off the naughty list and got both of the Santa gifts he wanted: an Imaginext Batcave and a Lego Batman airplane & Joker helicopter set. The only thing missing was a white Christmas, tho we did have a cold one. I’ve enjoyed my time off from work and Liam & I’ve both quickly become very accustomed to sleeping in late each morning, so it’s gonna be tough going back to real life again! I hope everyone had a wonderful holiday and I’m looking for 2013 to be a great year for all of us!